A photowalk is a networking event for photographers and people who enjoy photography to get out with their camera, meet some new people, learn some new techniques and take some cool photos at the same time. Photowalks are usually held by camera clubs and the people who show up tend to be a mixture of both professional and amateur alike which means that you get a nice mix of experience and skill sets during these events. Photowalks also act a educational tool for photographers to learn about different areas of photography and are also a great way for people who spend way too much of their time in front of their computer messing around in photoshop to get out shooting and meeting new people. For myself, going on a photowalk tends to be more of a relaxing day with my camera where I worry less about the results and focus more on having fun and meeting new friends. I've been part of a community of local photographers on Facebook for a while now and I've met some pretty good friends from the Photowalkers group. The group leader, Billy plans events every month or so in different locations and a group of us (Taiwanese and expats) will go out, take photos, chat and have dinner together when we're done. We also join up with the InstaMeet Taiwan group on certain occasions and have some fun critique sessions from time to time. Most of the photowalks are held in Taipei or around New Taipei City, but this time our photowalk was planned by a fellow Canadian expat living in Hsinchu and it got all of the regulars outside of Taipei and into some new territory for some new experiences. Tyson, the organizer of the event planned the event well in advance and it generated quite a bit of interest (even showing up in the Taipei Times a few days before) and looked like it was going to be one of our biggest photowalks yet! 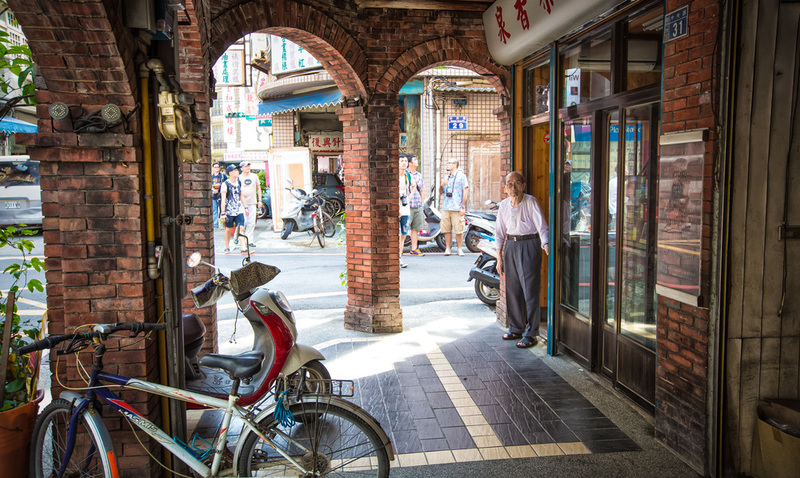 Hsinchu is one of my favourite cities in Taiwan and is actually closer to home than Taipei is - The city is a great one to visit and it has a lot of history visible on its streets in the downtown core. Tyson planned the event with a very detailed schedule of where we would visit and the route we would take. The route that was scheduled is pretty much the same route that I take almost every time I visit the city so I was more than happy to join up and show some of my photowalker friends around. I think he did a great job showcasing the city to the people who were probably experiencing it for the first time! The photowalk ended up being one of the largest ones we've had and it was quite successful despite it being the hottest day so far this year. I had a great time, took some nice photos, had some good food and spent the day with friends. That's a pretty good day if you ask me! I've probably mentioned a hundred times on this blog how much I aspire to be a somewhat competent street photographer - Street photography isn't easy and you have to be in the moment a lot of the time with an eye that is skilled at catching things as well as having a pretty good imagination. 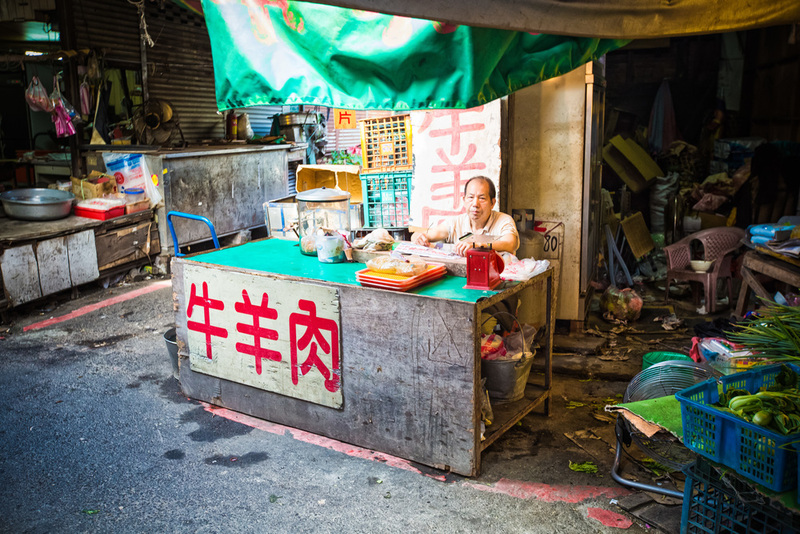 Hsinchu is one of the best cities in Taiwan for street work and my plan for the day was actually just to get street shots. I came out with some pretty interesting shots and I was quite pleased with them. I particularly love the photo below of the seamstress sitting in her shop, wearing one of the dresses she made while one of her other dresses is on display in the window. To be a successful street photographer you have to be good at combining candid shots of people in their environment as well as something else to make the shot interesting and I think I got some good results that day! 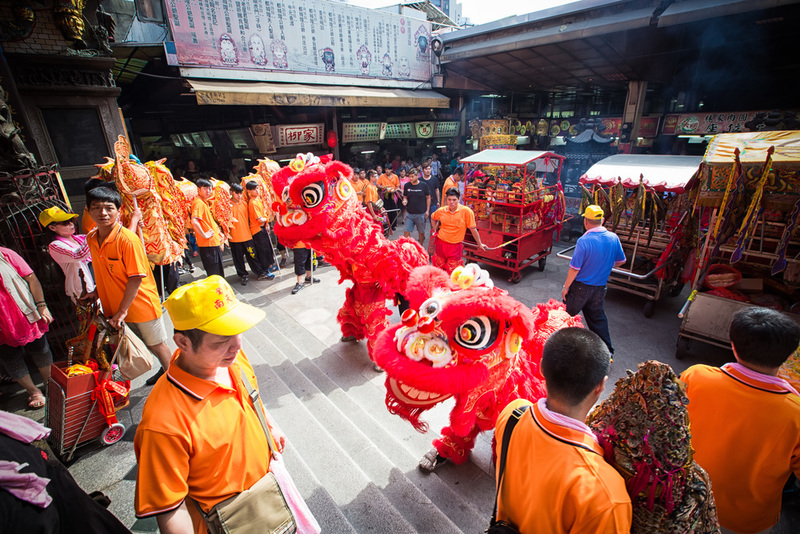 Coincidentally the day of our photowalk was the same as a small temple event happening at the Hsinchu City God temple (城隍廟). The temple is the headquarters of all the City God temples in Taiwan and on the day we were having our photowalk, followers from another temple had come to to pay homage and seek a blessing from the City God. 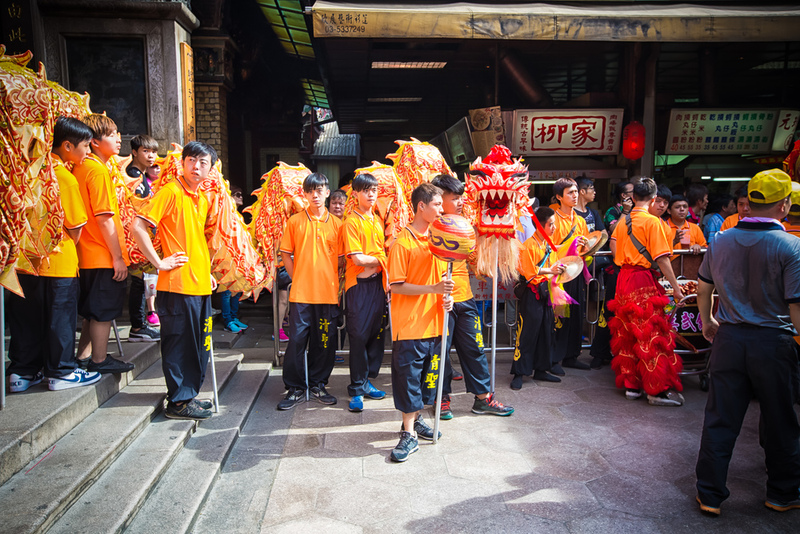 This type of event is common with Taoist temples in Taiwan and on that day there was a large procession that featured lion dances, firecrackers, music and the always cool-looking Eight Immortals (八家將). This is my kind of thing so I spent quite a bit of time taking shots of the event and got some pretty good shots of what was going on. 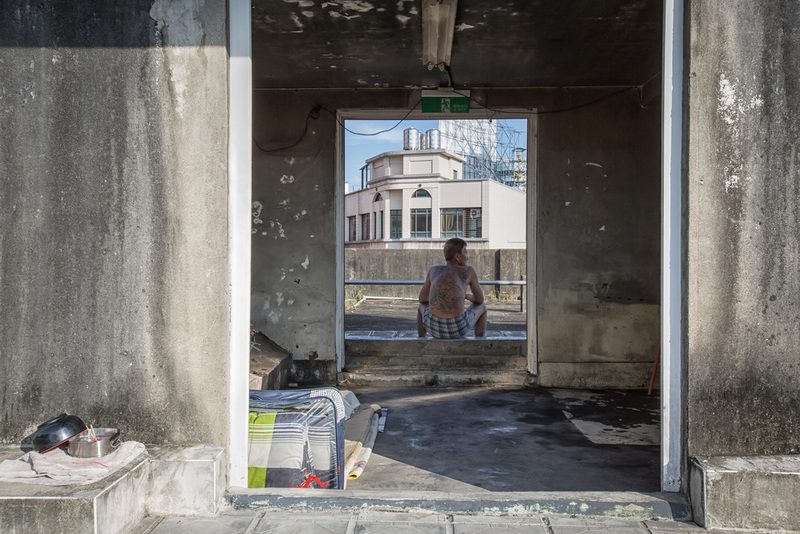 I noted on Facebook a few days ago that we sometimes have these pre-conditioned attitudes towards people over here in Taiwan - when we see guys with dark skin filled with tattoos, chewing betel nut and smoking cigarettes we often assume that they might be dangerous, but in most cases, especially with these temple festivals the people are always kind and are more than willing to share their culture with you. The Eight Immortals are supposed to be somewhat scary-looking and imposing figures from the underworld carrying weapons used for torture, however the guys cracked a smile and waved at me as I was standing next to them taking their photo. That's it for today - I hope you like the shots. If you have any questions about photowalks, the group or the photos, comment below and I'll get back to you.